» Archived Review: EMMA LATHEN – Murder to Go. 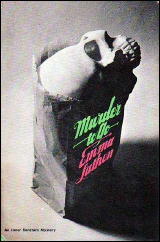 Archived Review: EMMA LATHEN – Murder to Go. EMMA LATHEN – Murder to Go. Simon & Schuster, hardcover, 1969. Pocket, paperback, September 1971 [the copy I read]. Several later printings. Whether he was ever promoted, I do not know. While I’ve read several of the books in the series over the years, I’d have to say it’s been twenty since last I did, and perhaps even thirty. And when I was a young man, what did I know of banking and investments, takeovers and mergers – the stuff, in other words, of the world of finance? Darned near nothing, and that’s reason I back then never did appreciated Thatcher’s adventures in mystery investigation anywhere nearly as well as I should have, I am sure. It is thus that the first death was accidental. The second, however, is decidedly not, and Thatcher, whose bank has a substantial stake in Chicken Tonight, is squarely in the middle of it. Thatcher was beginning to appreciate why Frank Hedstrom had shot to the top in the business world. Understanding money is a rare talent. Understanding people is even rarer. Understanding both is damn near nonexistent. As a detective, Thatcher is blessed with both curiosity and a penchant for tidying up loose strings. See page 161 for a longer analysis along these lines. Unfortunately, there is only a small coterie of suspects, and with one of them behaving most curiously out of character, naming the killer is a feat that should be within the grasp of even the leisurely of armchair detectives. Such as myself, I hasten to add, and the rest of the novel is equally if not even more entertaining. I may finally have to break down and read an Emma Lathen. PS. I can’t think of any of the Lathen’s that I’ve read that I would rank over this one — they’ve all been equally good, save for one, which took place in Detroit and I was disappointed in the authors when they got some of the streets going the wrong way (as I recall). It’s funny. I really liked these when I read most of them (and a few of their “R. B. Dominic” series) in the mid-1970’s, but I dropped them for some reason and never went back. Five years ago I did go back and read the next Lathen and Dominic titles but I’ve never really been interested or motivated enough to go back and finish the series. I think it was a product of its age and that age is long past. I enjoy Lathen’s works for their business aspects. They really know their stuff. The Detroit one would be something about Wheels in the title. I had a handful of these and read one and liked it then swung away from the series and, Like Jeff, never got back. Still, this review tempts me. So many books…and all that. Mary Jane Latsis was an economist and – Martha Henissart an economic analyst, which is why their take on the world of business was as authentic as it could get. At the time they were written, I should perhaps hasten to add. I’m sure you’re right: Murder Makes the Wheels Go ’Round (1966). With a minor in economics I enjoyed this bright series, but drifted away eventually although the books were still good. I think it was harder to find them in paperback that affected my later reading. Thatcher is one of the few nice guy detectives who is also sharp and competent. The books had humor but never at Thatcher’s expense. Re books with the background of fast food, I’m not sure, but doesn’t Some Buried Caesar deal with a chain of restaurants? Been thirty years since I read it, and all I really recall vividly is Wolfe on a rock in the middle of a field threatened by a bull. I remember that scene vividly too. It may be oe of the more unforgettable scenes in all of Wolfe and Archie’s adventures. “Wolfe and Archie are on their way to show orchids at an exposition in rural New York when a tire of their car blows, causing their car to crash into a tree. Uninjured, they notice a house across a large pasture and decide to walk there to phone for help, but before they arrive they are threatened by a large bull. Archie runs for the fence to divert the bull, giving Wolfe time to climb to safety atop a large boulder. Wolfe is subsequently retrieved by car by Caroline Pratt, a local golf champion who lives in the house nearby. Also note the first appearance of Lily Rowan! Like some of you, I enjoyed the Lathen and Dominic books a lot but haven’t read one in years. I remember a very funny scene in one of the Dominics: the protagonist and some of his fellow members of Congress are standing in the White House Rose Garden where the President is doing some kind of ceremonial appearance with the Prime Minister of Canada. Rain is threatening or maybe starting. The Canadian leader makes a seemingly interminable speech but finally brings it to a close, and the spectators are relieved they may soon be in out of the weather. But then he starts the same speech from the top in French. Steve, I don’t know if I was the first to mention the Lathen/Dominic connection in print. It’s always been my policy not to “out” pseudonyms I know about unless they’ve already been printed somewhere else first. Guesses, however, are fair game. I made some really bad ones (wondering if a pseudonymous former spook was yet another name for Howard Hunt; speculating on the basis of the Asian background that the Dean Koontz pseudonym Leigh Nichols was really John Ball), but Dominic I got right, the style being unmistakable, and it’s just possible I made my guess in print before it was generally known. I hope the link works. It’s a page from THE HEIRS OF ANTHONY BOUCHER, by Marv Lachman. It’s not clear if your guess first appeared in TAD, but Marv says that in the next issue, the identity of R. B. Dominic was confirmed by Pat McGerr. This was back in 1974.